Leave it to one of America's Sweethearts to throw her fans for a loop during Fashion Week. The eternally graceful Taylor Swift may appear to be a foregone conclusion sartorially speaking, but for New York Fashion Week the 1989 chanteuse made quite a statement by blending her silken frocks and car coats with — wait for it — sports jerseys. When one is as sought-after as Taylor Swift, Fashion Week is simply one of many significant occasions to occur from February 11 to February 19, and one such engagement was a guest appearance on The Tonight Show Starring Jimmy Fallon. As is typical of Swift's guest spots on Jimmy Fallon, there was a multi-costume skit which featured the dynamic duo sporting various team jerseys as they danced on the Jumbotron camera. Thus, Swift's impeccably planned Fashion Week wardrobe was punctuated by a handful of knit beanies and non-designer letterman jackets. Somehow, the singer managed to make each athletic ensemble look just as covetable as her red carpet gowns and chic street style apparel. Perhaps the impact of her looks could simply be traced back to immaculate hair and makeup, but Swift made each look work. 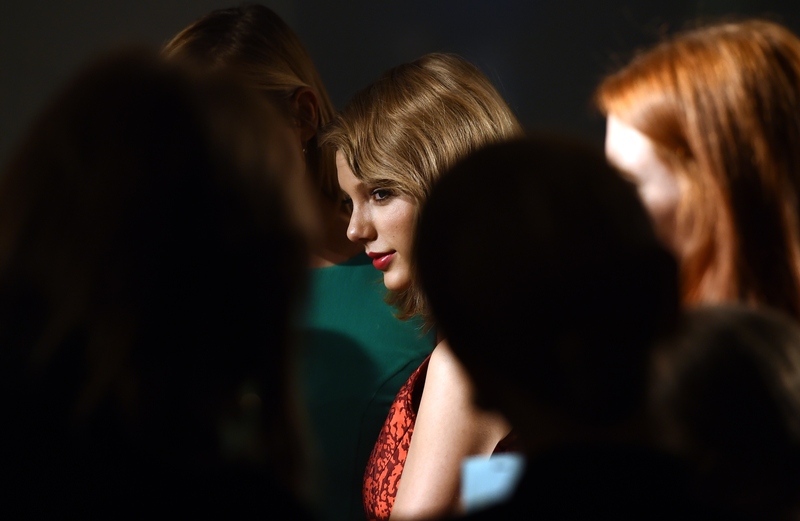 Read on for the definitive ranking of Taylor Swift's eclectic Fashion Week attire. Few ensembles rank higher than a frock designed by the masterful, late Oscar de la Renta. Swift paid homage to the great designer in a flared crimson silk dress with detailed, baroque embroidery when she made an appearance at the brand's Fall 2015 show. The ensemble is an all-star look. A minimalist Sachin et Babi jumpsuit accompanied Swift on The Tonight Show Starring Jimmy Fallon. With a single, draped lapel and slim tailoring, the jumpsuit made an elegant, not oppressive, statement. Though its protection against the cold was debatable, Taylor Swift's cream Shoshanna overcoat with circular tortoiseshell buttons certainly looked the part for an appearance at New York Fashion Week. I doubt any significant number of sports fans would look quite as charming in a knit cap and lurid orange sweatshirt as Swift, but then again, the singer does possess the miraculous ability to make anything appear worthy of an editorial spread. Regardless of the dropping temperatures outside, Swift donned a sleeveless cobalt blue jersey for her part two of her Jumbotron skit with Jimmy Fallon. I would call the look a throwback to the early aughts. Given the popularity of letterman jackets and the color grey over the course of the past year, it almost seems as though Swift's team jacket was already hanging in the singer's closet, waiting to be included in Fallon's skit.